So without further ado: the following are some items well worth considering, if you’re looking for a great gift for that special audiophile in your life. Charisma Audio of Toronto, Canada has its own line of extraordinary Moving-Coil cartridges, and the latest is the 103 model. Based on the famous Denon DL103, an audiophile favourite for decades, the Charisma 103 improves on the base Denon in several ways. It features a ruby cantilever, a super fine line contact stylus, and an exotic birds-eye maple wood body. Additionally, the suspension has been completely retuned, and the Charisma tracks at 2.1 grams, nearly half a gram less than the Denon. Update: I’m now reviewing the Charisma 103 – this thing sounds fantastic. Very open and transparent, the highs really sparkle and the cartridge sounds more detailed than any 103 variant I’ve ever heard. It’s still warm and musical like a Denon, but it now has the detail retrieval you’d associate with a Lyra. Amazing. I think a lot of DL103 afficionados will be adding the Charisma to their collections. For more information and to purchase the cartridge, visit Charisma Audio’s website. Musical Paradise is based in Edmonton, Canada, with manufacturing facilities in China. 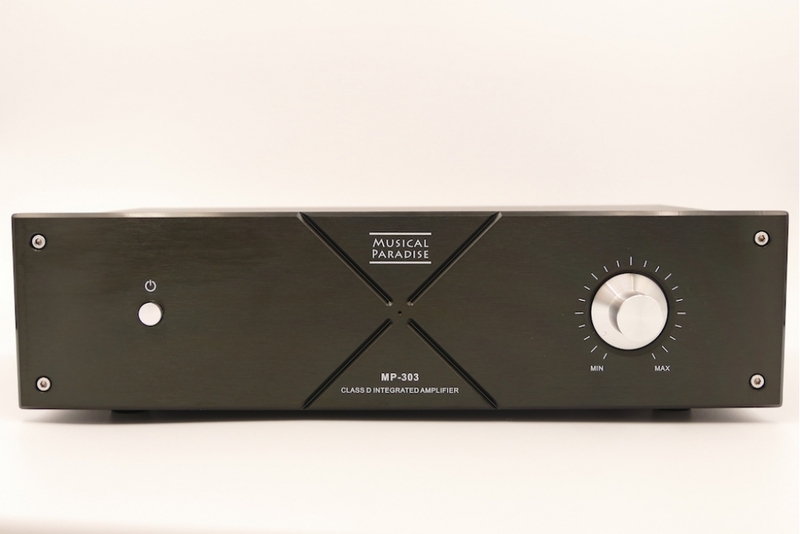 Brand-new in 2015, the MP-303 is the latest in a line of bargain amplifiers from Musical Paradise. With 50 watts of Class D power, this amp can drive almost any speaker. It features a tube-based preamp stage for great sound quality. It also has a built-in Digital-to-Analog Converter (DAC), making it a one-box solution (just add speakers). Tim Smith has received a review sample and is very impressed with this amp so far (review to follow). To inquire or purchase the MP-303, visit Musical Paradise’s website. Audiophiles take their cables seriously – but most of us also think it’s a bit of a “disease” to take these things TOO seriously. Enter the perfect antidote: AntiCables. The AntiCables have been around for several years now, and have won international acclaim and respect in the industry as a no-nonsense alternative to the usual megabuck offerings and outrageous claims (aka snake oil). These are, simply, superbly well-made cables that are designed to improve the signal transfer, and sound quality of most any audio system. These AntiCables and others are available from CN Thomas Acoustics. The well-reviewed GT40a from Alpha Design Labs (ADL) packs a lot into a small enclosure – both in terms of quality and functionality. It combines a high-end headphone amp, a cutting-edge DAC, and a MM/MC Phono section, all in one tidy package. If your audiophile is a headphone afficionado who plays vinyl and/or uses a computer as a music source, then this is really a full-function preamplifier. In fact, the GT40a can also drive the power amp in a speaker-based system – just no remote control. This is a very versatile, high-performing unit, and is sold locally by the great folks at AUDIYO. The ADL GT40a is available from AUDIYO’s website. Aric Audio is a New England-based specialty firm offering a number of unique, performance-oriented tube amp designs. I reviewed Aric’s terrific Expression preamp a few months ago (see review ‘A Pair of Peaches’), and called it “an excellent performer….very open and transparent.” Aric Audio’s gear is all hand-built to order, so it’s probably advisable to inquire early, for delivery in time to meet the holiday season. To purchase or inquire, contact Aric Kimball of Aric Audio. Both Tim Smith and I have owned several versions of this delightful amp. In fact, Tim chose it as his first review for Wall of Sound. Sold directly like all Musical Paradise products, over the last few years the MP-301 has only improved and strengthened its position in the marketplace. It’s a value leader, and a wonderful amplifier for both speakers and headphones. To learn more, or order the MP-301, visit Musical Paradise’s website. Lounge Audio has taken the analog world by storm with its’ amazing LCR Phono. By being sold direct to the consumer, this preamp competes with units costing far more. It’s reliable, looks great and is hand-built in California. I reviewed the LCR here, and bought the review unit – it’s my reference phono stage, and I recommend it highly. This is a preamp that can improve the performance and enjoyment of many turntable systems. To purchase or inquire, visit the Lounge Audio website. Audio Sensibility is another Canadian co that has developed a great reputation largely on high value-for-dollar cable products. The Testament model is where they begin using OCC Copper, so it’s seen as a bang for buck winner. AS have recently introduced the C7 or “Figure-8” style, which is becoming popular in many electronics, including the AppleTV, various gaming consoles and 4K HD televisions, and the Naim Mu-so Wireless Audio System. I have a sample and I can confirm, this is a very nicely-made, high-end cable (review coming soon). To purchase or inquire, contact Steven Huang at Audio Sensibility. Ottawa, Ontario’s Unity Audio have been making great cables at affordable prices for more than 10 years. Their Solid Link Speaker Cable has received a number of excellent reviews from both the audio press and from satisfied customers. Unity Audio uses only high-quality materials, and all cables are meticulously assembled by hand. To purchase or inquire, contact Omer Humayun at Unity Audio. Yalu Bulala uses MOV and TVS avalanche diodes for surge protection. TVS for all those little spikes that happen daily, the MOV for high-voltage surges. Gilbert Yeung’s Blue Circle Audio is one of the most innovative and well-known audio specialty companies around. Gilbert is an undisputed electronics genius, and many of his industrial designs are as creative and clever as his technical solutions. But what the heck is a Yalu Bulala?? Simply, it’s a high grade, two-stage surge protector – Think of it as an insurance policy for your valuable electronic equipment. It’s recommended to use one Yalu Bulala per household circuit. To inquire or purchase the Yalu Bulala, contact René Evans at Mystic Audio. If your audiophile is the DIY type, he already knows that Elekit of Japan make terrific audio component kits – the instructions are clear and detailed, parts quality is excellent, and attention to detail is second to none. Everything just goes together perfectly. This is not your grandpa’s Dynakit! These are high-end components that would cost 3-4 times more if they were sold assembled, at retail. British Columbia’s VK Music is North America’s importer and knowledge source for Elekit audio products. Update: I’ve recently completed the TU-8500 preamp – with excellent support from Victor – and it was a very satisfying experience (full review coming soon). The preamp has now been in my system for two weeks, and from the word go it added a ton of dimension and depth – it’s very quiet and refined too, and is exceeding my (very high) expectations. I love this preamp, I think it’s here to stay. The value for dollar in these kits is truly amazing. To purchase or inquire about the TU-8500, contact Victor Kung of VK Music. Here’s another great offering from Elekit. The TU-8200DX is an integrated amplifier which accepts two source inputs, and drives both speakers and headphones. This amp has received numerous rave reviews, including one by our own Tim Smith. The amp comes with 6L6GC power tubes, but can be used with other pentodes, including the EL34, 6550, KT66 and KT88 types. The fit and finish, and sound quality provided in this kit are superb. To purchase or inquire about the TU-8200DX, contact Victor Kung of VK Music. Pics from 2014 Salon Son/Image Montreal Show! Sign me up for news and updates! Wall Of Sound Turns 5! Digital Music Player Reviews: Part 2, The Lumin D1, Plus….Umm, Bonus Content!